As an Atlanta native, David has developed an extensive knowledge of the real estate market in the city ranging from resale properties to new home construction. 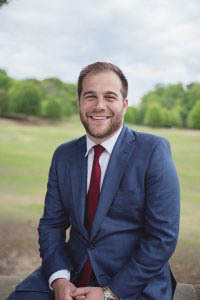 After earning his Bachelor’s degree in Real Estate from The University of Georgia and a Master’s degree in Construction Management from Georgia Tech, he began his real estate career. David prides himself on his clear, professional communication skills, commitment to customer satisfaction, negotiating power and ability to exceed client’s expectations. In 2014, David partnered with Inna Eidelman to create Sirzyk + Eidelman Group. In 2018, they partnered with Mike Toltzis to create the SET Real Estate Group. David is a proud member of the Atlanta Board of Realtor’s Multi-Million Dollar Sales Club for the previous 6 years and also is active in the Atlanta Realtors Association Young Professional Network. In 2016, David was featured as one of the Top 30 under 30 realtors by Realtor Magazine in the United States. We started the house hunt on a Saturday and a week later David took us to a house that we hadn't even seen yet but he had been watching. It was perfect, we fell in love immediately and put an offer in a few hours later. David's extensive knowledge of construction, renovations, and home inspections, he was able as we walked through the homes to give us sound advise and helpful tips. Negotiations and all processes from start to finish were handled with precision and urgency by David. Needless to say, we could not have done this without David. So beyond thankful for all his hard work and dedication to helping us find the perfect home. David was professional and knowledgeable every step of the way during our home buying process. We already knew exactly what we wanted and exactly what we were willing/able to spend, and David didn't try to push us too far out of our comfort zone. He helped us make sure we were exploring all of our options, and in the end we purchased a magnificent home where we will raise our family and make many memories for years to come. Thank you! Before we started the process to sell our house we have 3 realtors stop by. Of the 3, David stood out as he seems the most down to earth and easy to communicate with. He also seemed to have a great visions of the prospective buyer and what we could do to the property in pre listing to give us the best opportunity to sell. David was supportive throughout the prelisting process and even more so during the closing process. We were under contract within three days of listing and closed on time. We also went under contract for 6% over list price. David’s open communication and continuous hard work to make himself available to his clients would be his main strength. David sold our house in a matter of days. He knows the market extremely well and was able to help us price it just right. He provided great insight in making suggestions for minor home improvements before going on the market, and his photography team made the house look amazing. He also helped us purchase a lot and build a new home. He continued to work with us thru the entire building process and provide valuable insight and assistance when needed. David is knowledgeable, friendly, and always available. I'd highly recommend him to anyone looking to buy or sell a home in the Atlanta area. David's help was more than we could have ever hoped for. As out of town buyers looking to move to Atlanta, he constantly went above and beyond for us as our realtor. He was kind enough to work around our schedules when we were in town or Facetime us to see a house he thought might fit our needs. His knowledge of the various neighborhoods within Atlanta is unmatched and very helpful to anyone unsure about which one might be right for them. David is the epitome of a true professional and could not have made our experience any better. We look forward to working with him again in the future!